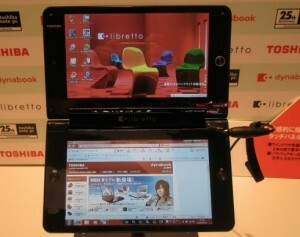 We had earlier reported on the Toshiba Libretto dual screen laptop which is quite innovative for itself. The Toshiba Libretto W100 is a dual screen tablet or a mini-laptop with a virtual keyboard instead of a physical one. It plays both roles perfectly, a tablet when you want it and a laptop when needed. Toshiba plans to sell limited number of devices soon and these will be available only in Japan for now. Gadget geeks Wow Pow have got their hands on the device and have posted the unboxing video. For those who are new, the Toshiba Libretto W100 has two 7 inch capacitive touchscreen displays with resolutions of 1024 x 600 pixels. It is blazing fast with a 1.2GHz Intel Pentium U5400 processor, 2GB of DDR3 memory, and a 62GB solid state disk. It comes with standard 802.11b/g/n WiFi, WiMAX, and Bluetooth and has a webcam, USB port, microSD card slot, and comes with 2 or 4 hour batteries. It weighs just over 1.5 pounds. There is no info on what operating system this device would run and if Android is being considered. The device comes with several different keyboard styles which allow you to hold it in both the hands to type. The price for the laptop/tablet is expected to be around $1100. There is still no word on when there will be a US launch.